Featuring exceptional interiors amid the most luscious outdoors, Villa Vikasa is the epitome of modern, tropical living packaged in a luxurious holiday home. 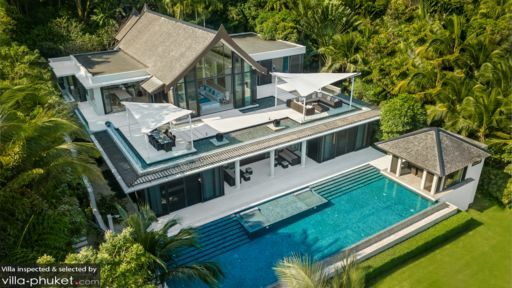 Nestled on Cape Yamu with stunning views of Phang Nga Bay, the villa is breath-taking with its open-plan living areas, stunning Thai architecture with a modern twist, and lavish swimming pool that is the crowning jewel of the property. Luscious and well-kept gardens allow you to enjoy the fresh breeze while lazing about on the freshly-cut grass. Phuket has much to offer in terms of white-sand beaches and bountiful sights that you can explore with friends and family. 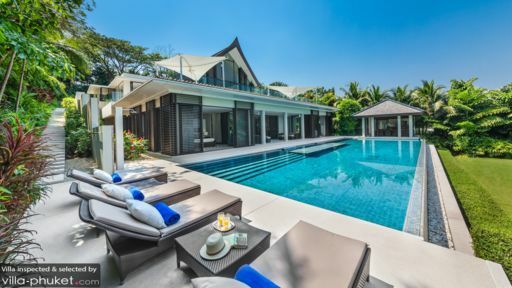 The five bedrooms at Villa Vikasa are housed all around the property and a majority of them offer enviable views of Phang Nga bay, the pool and/or the sea. The master bedroom is spacious and features floor-to-ceiling glass windows overlooking a spellbinding panorama of the ocean water and vast skies. The guest bedrooms are furnished with king-sized beds or two single beds as per your request and one of them even leads to a terrace with outdoor seating. The bedrooms are air-conditioned and designed with a minimal elegance displaying muted and fresh colours, focussing more on the outdoors. Flat-screen TVs, surround sound, and seating for two is available in each room. The ensuite bathrooms are equally luxurious with rain showers, bathtubs, toiletries, and other amenities. At Villa Vikasa, the 25-metre, Olympic-sized swimming pool is the perfect refresher you need during the daytime. You can start off with a rejuvenating lap to be followed by lounging in the Jacuzzi. A few steps lead down to the verdant gardens that are luscious and abundant with tropical flora. Sunbeds line the pool deck and you even have an outdoor lounge with comfortable seating. The poolside sala is enclosed holding a dining area, bar, kitchenette, etc. With SONOS sound system, guests can have a garden party by firing up the BBQ and enjoying a dance session. The high-peaked ceiling of Villa Vikasa is traditionally Thai but with a modern twist as it has been painted in a colonial style with white wooden beams and trusses. The beautiful living area faces the sea and the bay area directly as it is located upstairs. The entertainment area is located poolside featuring vibrant shades of blue from periwinkle to turquoise to compliment the sea and sky. Comfortable seating is placed facing the pool and you even have a dining area, kitchenette, flat-screen TV, X-Box, and an Apple TV. The air-conditioned living room is a luxurious, contemporary space with the only colour afforded by the upholstery. The ten-seater dining table features beautiful, powder blue chairs under long-stemmed ceiling fans. The rustic chandeliers add a remote elegance to this space heightened only by the colossal columns in the room. Gorgeous artwork lines the walls, striking for their significant strokes, dark colours, and arresting features. You will find ample lounging space both indoors and outdoors. The opulent, fully-equipped kitchen at the villa is fitted with top of the line amenities and appliances including the WMF Espresso machine for your caffeine fix. There are plenty of activities, amenities and services on offer to the guests of Villa Vikasa. A games room with a pool table, parking, tennis court as part of the estate, and fitness centres with spa facilities are only the tip of the iceberg. A private chef, housekeeper, and guest assistance are offered as part of your stay with additional services such as car rentals, kayaks, vans, in-house massages etc. (charged extra). Views that sweep across Phang Nga Bay and a location that puts you close to many of the amazing beaches in Phuket make Villa Vikasa a top choice for a tropical getaway. 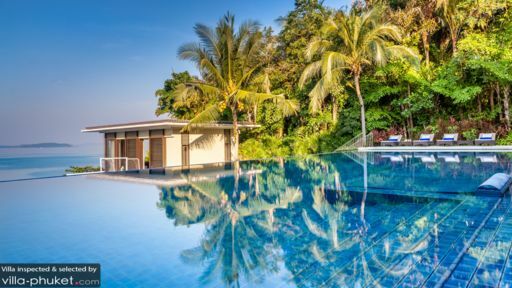 Surin beach and Bang Tao beach are a 30-minute drive from the villa so you are not too far from civilisation and yet you have the luxury of serene beaches and quiet surroundings.